The Ministry of Environment of the Republic of Korea (MOEK) and Korea National Park Service (KNPS) have developed the Korea Database on Protected Areas (KDPA) as a means to organise and compile national data on protected areas. The standardised nature of the database is expected to help improve the effectiveness of policymaking process related to protected areas. 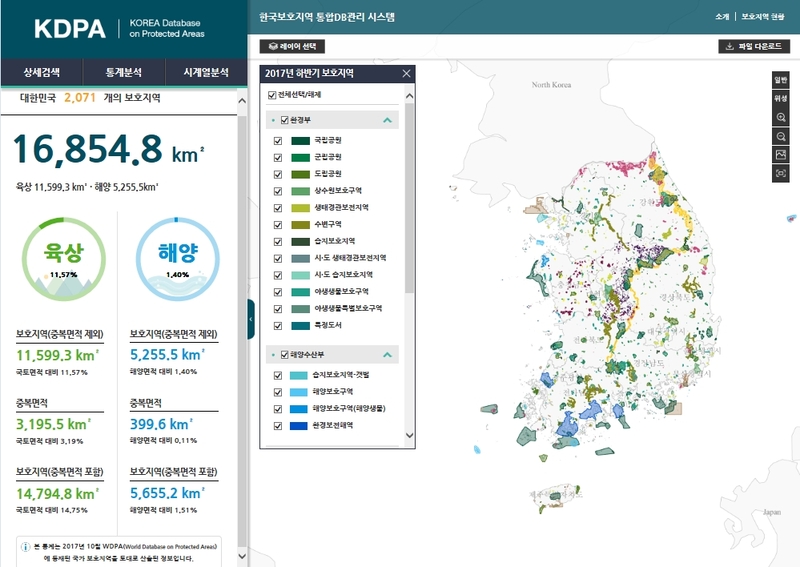 The KDPA enables the statistical analysis of protected areas in Korea, and provides basic information on topics such as protected area coverage, designation year, type, governance type, and management category according to IUCN. Currently, the KDPA includes information on over two thousand protected areas covering almost 17 thousand km2, including 11.6 thousand km2 of land and freshwater, and around 5.3 thousand km2 of ocean and coastline. At the global level, the World Database on Protected Areas (WDPA) is used to track the progress toward Aichi Biodiversity Target 11, which calls for the protection of 17% of terrestrial and inland freshwater areas and 10% of coastal and marine areas by 2020, as part of the Convention of Biological Diversity (CBD) Strategic Plan for 2011-2020. In the Republic of Korea, protected areas are designated by five different ministries according to 14 laws, and protected areas data and information are managed independently. This led to delayed representation of Korea protected areas data in the WDPA, which necessitated the creation of the KDPA. Click HERE to access the KDPA. Korea National Park Service (KNPS) is a professional protected area management organisation established in 1987. It manages around thirty percent of Korea’s protected areas including 21 national parks. Guided by its vision: ‘Leading Protected Areas Management by Connecting Nature, People, and the Future’, KNPS commits its resources to achieving conservation and sustainable use of national parks, and provides support to locally-managed protected areas. The Asia Protected Areas Partnership is generously supported by the Ministry of Environment Republic of Korea, the Korea National Park Service and the Ministry of the Environment Japan.